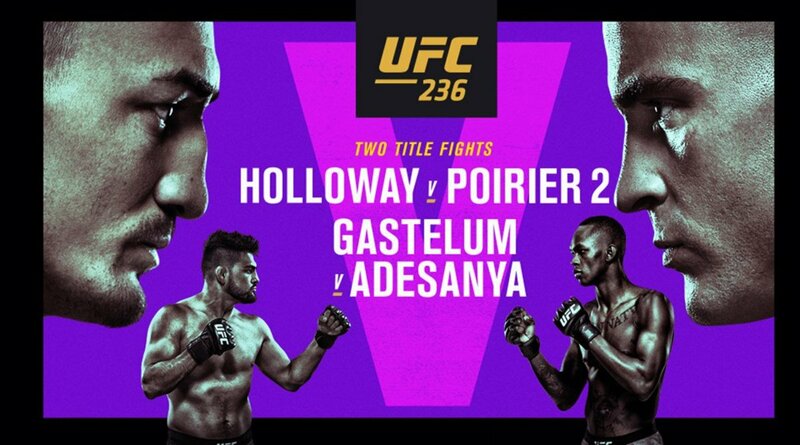 Welcome to F4WOnline.com's live coverage of UFC 236: Holloway vs. Poirier 2, emanating from the State Farm Arena in Atlanta, Georgia. The Octagon returns to Atlanta for the first time since 2016 with two title fights headlining the card, albeit they are for two interim championships. UFC Featherweight Champion Max Holloway moves up to 155 pounds in an attempt to become a two-division champion when he takes on Dustin Poirier for the Interim UFC Lightweight Championship. Holloway and Poirier fought once before, at UFC 143 in February 2012, a bout won by Poirier. Since then, both have grown as competitors to become two of the best in the world. In the co-main event, the Interim UFC Middleweight Championship will be on the line as Kelvin Gastelum and Israel Adesanya do battle. Gastelum lost his chance to become the UFC Middleweight Champion at UFC 234 in February when champion Robert Whittaker had to pull out on fight day due to emergency surgery. Adesanya ended up headlining that event, scoring a win over Anderson Silva to remain undefeated at 16-0. Also on the main card is a pair of light heavyweight bouts as Eryk Anders takes on Khalil Rountree, and a rematch between Ovince Saint Preux and Nikita Krylov takes place with Krylov looking to even the score between them. Davis right away with a leg kick but Costa counters with a big right hand that rocks Davis for a moment. They start throwing bombs at each other. Davis with a body kick followed by a knee as they clinch. Costa with a head kick after they break. Davis with a right hand. They both land punches. Costa with the jab and an uppercut to the body but Davis tags him with a right hand. Each man landing punches. Both landing the jab. Costa with a right hand as Davis is against the fence. Costa with a high kick and a knee to the body. They trade leg kicks. Davis with an elbow. They trade at the end. Fun round. 10-9 Costa. Costa rocks Davis with a right hand and starts throwing punches but Davis gets a clinch. They break and both throwing punches and kicks. Davis lands a combo and a knee and hurts Costa. Costa shoots for a takedown and Davis defends and gets the back and has a rear-naked choke locked in and Costa taps! Nice submission for Davis in a real fun fight. Botelho with a leg kick. They trade punches and kicks. Botelho with a spin kick that partially lands. Botelho with a big body kick that hurts Mueller. Botelho gets a takedown and is in the half guard. Botelho gets to the full mount. They get back to their feet and Botelho has the clinch and is landing knees against the fence. 10-9 Botelho. They trade punches. Botelho with a leg kick. Botelho just misses a spin kick to the body but lands a high kick. They trade punches and then clinch. They battle for underhooks. Mueller with a hard elbow but it allows Botelho to get a takedown into the guard. Mueller able to get to the fence and uses it to get to her feet. They battle for underhooks against the fence. Botelho lands some short knees against the fence. Botelho with a spin kick to the body after they are broken up by the referee. Mueller lands a body kick followed by a right hand. 10-9 Botelho, 20-18 Botelho. Mueller stalking Botelho and landing some punches as Botelho backs up. Botelho misses a spin kick. They clinch and Mueller has the edge against the fence but Botelho reverses. Not much happens and the referee splits them up. They each land a jab. Botelho shoots for a takedown but Mueller shakes it off. They trade punches and Mueller lands some big punches. Mueller landing big shots and lands a leg kick that trips Botelho up. Mueller goes into the guard and that might have cost her the fight. She could have possibly finished Botelho standing. Mueller gets to the half-guard but Botelho hanging on as the fight ends. 10-9 Mueller, 29-28 Botelho. Soukhamthath with a leg kick. Jackson with a left hand. Jackson with a combo. Jackson with some leg kicks. Soukhamthath with a leg kick. Slow pace to this first round. Jackson with a high kick and Soukhamthath throws a leg kick. They trade body kicks with Jackson landing harder. Soukhamthath with a knee to the body. Jackson with a combo and looks for a takedown. Jackson completes the takedown. Soukhamthath uses the cage to get to his feet. Jackson gets another takedown. 10-9 Jackson. They trade to start the second round. Soukhamthath with a leg kick. Both men being patient. They trade leg kicks. They are trading and Jackson is landing big punches. Soukhamthath is firing back but Jackson really opening up and landing lots of big punches. Big right hand from Jackson and Soukhamthath has one hell of a chin. Jackson gets the clinch. Jackson gets a takedown and is in the full guard of Soukhamthath. Jackson finishes the round on top. 10-9 Jackson, 20-18 Jackson. Jackson starts landing the jab. Soukhamthath goes for a high kick but gets hit in the groin with a kick and goes down and we have a timeout. Jackson gets Soukhamthath to the ground and is in the full mount. Jackson landing big punches and elbows. Soukhamthath giving up his back and Jackson still landing punches. Soukhamthath recovers half-guard. Jackson looking for the kimura and landing body punches. Jackson gives it up but still landing in the full guard. Soukhamthath goes for an armbar but Jackson easily defends. Jackson with hammerfists at the end. 10-9 Jackson, 30-27 Jackson. Millender just missed a head kick to start the action. Millender with a leg kick and then one high. Muhammad with a right hand and then a left hook. Millender with a leg kick. Millender cuts Muhammad open with a jab. Millender with another jab. Muhammad goes for a single leg but Millender defends. Millender stuns Muhammad with a right hand and then a late body kick. 10-9 Millender. Muhammad initiates a clinch against the fence right at the start of the second. Muhammad with short knees and some foot stomps. Muhammad working for a takedown but lets go and they break to the center. Millender just misses a flying knee. Millender lands a right hand. Muhammad with a leaping left hook. Muhammad just misses an uppercut. Muhammad shoots in and finishes the takedown. Muhammad with some punches from the top. Muhammad keeping Millender on the bottom. Muhammad in the full guard and landing to the body. Muhammad with two big elbows. 10-9 Muhammad, 19-19. They trade kicks. Muhammad shoots for a takedown but Millender defends with a knee to the body. Muhammad with a right hand and then a left hook. Muhammad with another right hand. Millender is slowing down. Muhammad shoots deep for a takedown and completes it. Muhammad in the half-guard of Millender. Muhammad with punches from the top. Muhammad gets to the mount. Muhammad with more punches from the top. Muhammad goes to side control and back to mount and reigning down elbows. Millender gives up his back and Muhammad looking for a choke. Muhammad with punches. Big finish by Muhammad. 10-9 Muhammad, 29-28 Muhammad. Taha lands a right hand and then drops Salmon with a huge left hand and then finishes him off with punches on the ground. This went less than a minute. Salmon got up and was upset at the stoppage but he was done and was stumbling to his feet. Huge knockout win for Taha. Imadaev with a leg kick but Griffin takes him down and has the back. Imadaev has grabbed the fence three times during the takedown and using to get his feet up. The referee calls a timeout and docks Imadaev a point for the fence grabs. Imadaev lands a knee and Griffin looking for a takedown and gets it. Griffin has the back and working for a choke. Griffin has a neck crank in and is squeezing. He lets go though. Imadaev grabs the cage again. Imadaev keeps grabbing the fence as Griffin is trying to improve his position. They get to their feet. Imadaev lands a spinning elbow and a high kick. Imadaev has the body lock. Griffin lands a knee to the body. 10-8 Griffin. Imadaev tries a spin kick but Griffin grabs the back mid-spin and gets a takedown. They get to their feet but Griffin still has the back and switches to front control. Imadaev reverses positions. They break and Griffin with a leg kick. Griffin gets a takedown but Imadaev gets back to his feet. Imadaev misses the spinning elbow. Griffin gets another takedown against the fence. They get up and Imadaev with a knee to the body. Imadaev with a right hand. Both men are tired. Imadaev with a body kick. Imadaev lands a spinning fist. 10-9 Imadaev, 19-18 Griffin. Imadaev with a left hand. Imadaev looks to be the fresher fighter. Griffin with a body kick and Imadaev counters with a leg kick. Imadaev with a left hand followed by an uppercut. Imadaev with a combo. Griffin with a leg kick. Imadaev with a right hand. Imadaev with a combo. They trade punches. Griffin with a right hand and he is tired. Griffin gets a takedown but Imadaev gets up. Griffin lands some knees to the body and Imadaev is hurt. Griffin has the body lock. Griffin with a knee to the body in the clinch. They break and Griffin lands a right hand. They trade late and Imadaev rocks Griffin. This may be a draw. 10-9 Imadaev, 28-28. Reis with a leg kick and Pantoja counters with a right hand. Reis lands a right hand and goes for a takedown against the fence. Reis tries for a trip but Pantoja defends. They break. Pantoja then drops Reis with a right hand and starts landing punches on the ground. Pantoja with big punches and the referee stops the fight. Big knockout win by Pantoja. Frevola gets a takedown and takes the back. Frevola with punches and still has back control. Turner defending. Turner rolls out and they get to their feet. Turner lands a right hand that hurts Frevola. They trade punches and Turner grabs a guillotine as Frevola goes for a takedown. They go to the mat and Frevola has side control. Frevola then locks in a guillotine and rolls to the top. It is in tight but only an arm-in guillotine. Turner gets out and Frevola on top. Turner rolls from under and is on top and lands punches. They scramble to their feet. They trade at the end. 10-9 Turner. Frevola goes for a takedown but Turner defending it against the fence and he gets free. Frevola shoots again but Turner escapes. Turner with a combo. Frevola with a body kick. He's landing the lead left hook. Frevola goes for a takedown but Turner has the neck and looks to lock in a guillotine choke. Frevola rolls out and ends on top in Turner's half-guard. Frevola grabs the neck and locks in a guillotine but Turner pops out. Frevola lands an inadvertent upkick that was illegal. They continue but the round ends. 10-9 Frevola, 19-19. Frevola with a leg kick and a right hand. Turner lands a combo. They trade punches and Turner lands a big right hand. Turner with a left hand. Frevola shoots and completes the takedown. Turner went for a triangle choke but Frevola escaped. Frevola with body punches from side control. Frevola remains in side control but they scramble up. Turner lands a big knee and Frevola backs up. Turner with a spin kick. Turner couldn't connect with a flying knee. Frevola with a right hand. Turner with a left to the body. They trade at the end. 10-9 Frevola, 29-28 Frevola. Krylov with a body kick to start things off. Saint Preux gets a takedown against the fence. Saint Preux trying to pull Krylov to the center but Krylov gets to his feet. Saint Preux gets another brief takedown but they get back to their feet. Saint Preux gets another takedown and is in the guard. Saint Preux gets full mount and lands elbows but Krylov escapes and they get to their feet. Krylov lands some knees. Saint Preux misses a left hand. Krylov gets the clinch against the fence and misses a high kick on the break. 10-9 Saint Preux. Krylov with a body kick. Krylov with a right hand. Saint Preux goes for a takedown. Krylov gets a takedown and has the back of Saint Preux and is working to set up a choke. He lands punches from the back. Krylov has the rear-naked choke locked in and it's in deep and Saint Preux taps! Big submission win as Krylov evens the score with Saint Preux. Jouban gets a takedown right away but Grant gets right up. Jouban just barely misses a head kick as they break. Grant with a big punch. They are separated and both looking for an opening. Grant with a leg kick and then hurts Jouban with a combo and a big left hook. Jouban ate them good. Grant with a looping left hand. Jouban with a high kick. Grant with an inside leg kick. Grant with a body kick. Jouban looking for a head kick but eats a right hand from Grant. 10-9 Grant. Grant with a combo on Jouban. Jouban missing on his punches and Grant is missing now as well. Jouban with a leg kick. Grant with a combo and backs away. Grant with a leg kick and they both miss punches. They clinch for a moment but break. The crowd is booing as there hasn't been a lot of action. Jouban with an inside leg kick. Not a lot to this round. 10-9 Grant, 20-18 Grant. Jouban with a combo. Grant with a leg kick. Jouban with a leg kick and Grant fires back with a combo. Grant with a high kick. Jouban blocks a high kick from Grant but eats a right hand. Jouban with a leg kick. Pause in the action as a kick hit Grant in the groin. Back to action and both land kicks. Leg kicks from both men. Not an exciting fight at all. Jouban gets a late takedown and has the back as the fight ends. 10-9 Jouban, 29-28 Grant. Rountree with a leg kick. Rountree with more leg kicks. Rountree with more fast kicks. Rountree with a left hand. Anders unable to land anything halfway through the round. Rountree with more hard leg kicks to Anders' lead leg. Anders lands a combo but eats a knee to the body from Rountree. Anders with a left hand. 10-9 Rountree. Rountree drops Anders with a left hand and Rountree landing kicks to Anders on the ground. Rountree with a hammerfist and lets Anders up. Rountree drops Anders again with a left hook. Rountree with more kicks to a downed Anders. Anders gets up and shoots for a takedown but Rountree defends. Anders with a high kick. Rountree with a left hand. Rountree with a combo and he drops Anders again with a right hand. That is the third knockdown for Rountree this round and he lets Anders up again. Rountree with a body kick. Rountree knocks Anders down again. Rountree lets him up. Rountree with a leg kick. Big round for Rountree. 10-7, 20-16 Rountree. Anders continues to fight. Rountree lands a combo. Rountree misses an uppercut but lands a left hand. Rountree with an inside leg kick. Rountree with a combo. Anders looks like he's going for a takedown but Rountree stops it with a right hand. Anders misses a combo. Rountree with a right hook. Rountree with an inside leg kick. Anders lands an uppercut. 10-9 Rountree, 30-25 Rountree. Adesanya with a leg kick followed by a left hand. Adesanya with a hard body kick. Gastelum with a leg kick. Adesanya with a body kick. Gastelum trips Adesanya up with a left hook. They trade left hands. Adesanya with a high kick. Gastelum lands a left hand. Gastelum lands a lead right hook. 10-9 Gastelum. Adesanya with a body kick. They trade punches. Gastelum lands a left hand over the top. Gastelum with a left hand and Adesanya counters with a body kick. They trade strikes. Adesanya with a high kick and Gastelum counters with a combo. They trade punches and Adesanya drops Gastelum with a right hand. Gastelum gets back to his feet. Adesanya with an inside leg kick. Adesanya with a right hand. Adesanya landing moe punches now and a hard right hand. Adesanya with another right hand. Adesnaya with a spinning elbow that connects and Gastelum is hurt. Adesanya with an inside leg kick. Gastelum attempts a takedown but easily defended by Adesanya. 10-9 Adesanya, 19-19. Adesanya with a leg kick. Gastelum with a left hand to the body. Adesanya with a right hand followed by a head kick. Adesanya with an inside leg kick. Gastelum with a leg kick and Adesanya counters with a high kick. Adesanya with a right hand and a knee to the body. Gastelum lands a right hand. Adesanya with a right hand followed by a body kick. Gastelum gets a takedown but Adesanya pushes off and gets to his feet. Adesanya with a high kick. 10-9 Adesanya, 29-28 Adesanya. Gastelum gets a clinch but lets go. Adesanya with a leg kick. Gastelum with a leg kick. Adesanya with a knee to the body. Adesanya with a hard right hand. Gastelum lands a short left hand. Adesanya with a right hand and then lands a straight right hand followed by a high kick. Gastelum lands a jab. Adesanya with an inside leg kick. Gastelum lands a head kick and Adesanya wobbles. Gastelum with a punch and Adesanay is still in trouble. Adesanya with a right hand. Gastelum with a left hand. 10-9 Gastelum, 38-38. Gastelum with a left hand. Adesanya with a quick combination. Adesanya with a front kick to the face. Adesanya lands a left hand. Adesanya lands a huge right hand. Adesanya gets a standing guillotine but Gastelum spins out and they get to the mat and Adesanya looking for a triangle but Gastelum gets ut and they scramble to their feet. Adesanya with a big combo. Adesanya with a huge right hand. Adesanya with another right hand followed by a leg kick. Adesanya with another huge right hand. Adesanya drops Gastelum with a big combo ending with a right hand. Gastelum gets up and shoots for a takedown. Adesanya with some big elbows. Adesanya landing more big punches and Gastelum in trouble and gets dropped again. Adesany grabs the neck on the ground and then lands punches. They get to their feet and both landing punches and Adesdanya drops him again and they finish on the mat. Absolutely tremendous fight. 10-8 Adesanya, 48-46 Adesanya. Poirier with a front kick to the body. Poirier with a leg kick. Holloway with a combo. Poirier with a body kick. Poirier with a left hand and then a combo. Holloway clips Poirier with a right hand. Holloway with a combo against the fence. Poirier resets. Poirier with a right hand that hurts Holloway. Poirier landing big punches. Holloway eating them and firing back. Poirier with another big right hand. Poirier with some knees and another huge right hand. They trade punches inside the pocket. Holloway now landing punches as Poirier takes a deep breath. Poirier hurts Holloway again. Poirier with another big combo. Holloway lands a right hand. Holloway with a head kick. 10-9 Poirier. Holloway with a looping left hand. Holloway lands to the body and then to the head. Poirier with a leg kick. Poirier with a combo. Poirier with an inside elbow. Poirier with a snapping straight left hand. Holloway with a high kick. Poirier attempts for a takedown but Holloway pushes him off. Poirier with the jab. Holloway with a combo ending with a body kick. Holloway with another body kick. Holloway with a right hand. Poirier hurts Holloway with a punch and starts throwing against the fence but Holloway circles away. Poirier rocks Holloway with a right hook. Poirier rocks him again late. 10-9 Poirier, 20-18 Poirier. Holloway with an inside leg kick. Holloway with a right hand to the body but Poirier lands a counter right hook. They each land left hands. Poirier with a body kick but Holloway counters with a combination. Poirier with a huge combo. Holloway lands a right hand. Holloway with a combo. Poirier with a right hand. Poirier with a straight left hand. Holloway with a right hand. They trade punches inside the pocket. Holloway landing a lot of punches against the fence on Poirier. Holloway with a flying knee to the body. Poirier grabs the body looking to score a takedown. Holloway defending with hard elbows against the fence. 10-9 Holloway, 29-28 Poirier. Holloway lands a right hand. Poirier tries deep for a takedown and gets it against the fence. Holloway gets up and has Poirier's neck. Poirier with a knee to the body as they break. Holloway pouring it on with combinations against the fence. Poirier looking tired. Poirier now fires back with punches. Holloway with combos against the fence and landing to the body. Holloway to the body and lands a right hand to the body. Poirier with a right cross. Poirier lands a knee and Holloway has a massive cut on his forehead. Holloway lands a combo and is coming on strong. Poirier tries a takedown but Holloway has the neck. We are going to a final round. 10-9 Holloway, 38-38. Poirier with a leg kick. Poirier with a left hand. Huge chants for Holloway. They each land right hands. Holloway with a combo. Holloway with a body kick. Poirier with the stiff jab. Holloway with a combo. Poirier with a left hand. Holloway with a combo. Holloway is draining blood. They trade punches. Poirier trying for a late takedown but Holloway defending against the fence. Both men are a mess right now. They break the clinch. They both swing wildly at the end. Close fight. 10-9 Poirier, 48-47 Poirier.